I have been working on mocking an existing app(Futbin) in Android and iOS to Flutter. For that, I am learning on how I can make the individual components. And once all the individual components are being made, I will integrate them in the single app. Today, I was thinking of trying out how I would switch between widgets based on the selection of the buttons above. I am not talking about App bar with Tabs and the BottomAppBar. Have a look at the below image. It’s crystal clear from above image that, on click of each of the three buttons Graph, Stats, Info the widget that loads below is different. Widgets highlighted in bold are the core widgets of this layout. A Column having Row and Container as children. Container , let’s call it parent container, will have a custom child container as it’s child, whenever one of three buttons are pressed. Which container to put in the parent container is the real question here? Well, this can be solved by using an enum. and define a variable of WidgetMarker type in BodyWidgetState class, that will hold the currently selected child. Now, it is the time to put the come code under setState of each button. Parent container’s child will be one of the three above child containers. Let’s return one of these containers based on the selectedWidgetMarker using simple and effective switch statement. 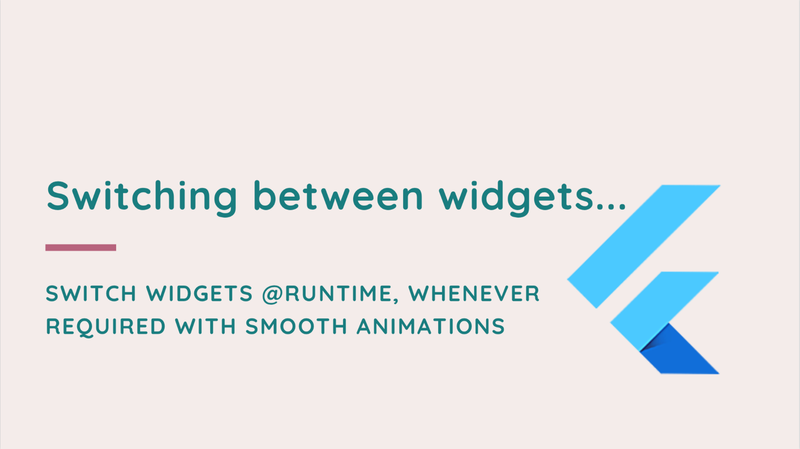 That’s how our static layout becomes dynamic by building the widget on pressing any button. This is it, for the scope of this article. But, please do check out the complete video tutorial step by step, that has some animations andFutureBuilder added to this scenario. If you liked the article, hit the clap and follow me for more articles on Flutter. Comment for any questions or feedback.